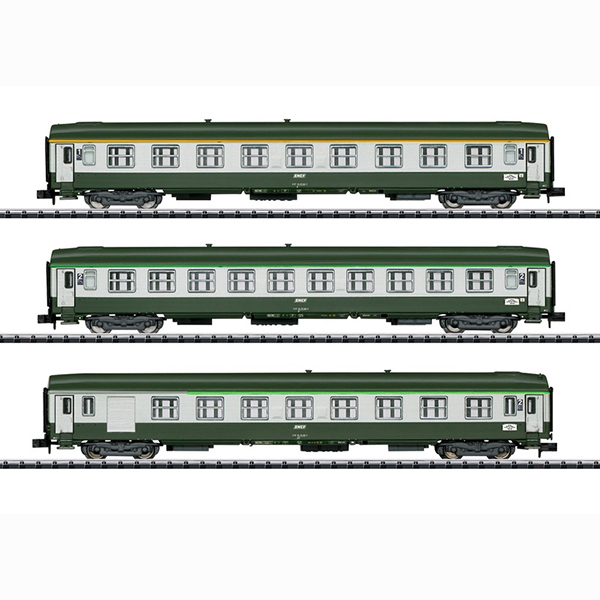 Prototype: One (1) type A9 express train passenger car, 1st class, one (1) type B10 express train passenger car, 2nd class, and one (1) type B7D express train passenger car with a baggage area, painted and lettered for the French State Railways (Société nationale des chemins de fer français / SNCF). Use: High-quality long-distance service, here in the D262/263 Orient-Express of 1987. Model: These cars have tooling variations with smaller door windows. The cars have close coupler mechanisms. Interior lighting can be installed in the cars. Total length over the buffers 459 mm / 18-1/16".